With Bebop and Rocksteady set to appear in June’s Teenage Mutant Ninja Turtles: Out of the Shadows film, it’s the perfect time for IDW to launch a new miniseries starring the humanoid mutant warthog and rhinoceros pair. The publisher has assembled a dynamite creative team for the weekly TMNT: Bebop & Rocksteady Destroy Everything, a madcap time-travel adventure that puts the fate in the universe in the hands of the Ninja Turtles’ foes, and it’s especially exciting to see two creators who are typically artists co-writing the title. Dustin Weaver has impressed with his recent writing work at Marvel Comics, most notably last year’s The Infinity Gauntlet miniseries with Gerry Duggan, and he’s joined by Ben Bates to tell Bebop and Rocksteady’s story. Bates draws the first issues, but every subsequent chapter has a different artist joining the writers, including Sophie Campbell & Giannis Milonogiannis (#2), Damian Couceiro (#3), Nick Pitarra (#4), and Ryan Browne (#5). It’s a stellar line-up, and there’s so much strong artistic talent on this book that it should appeal to even those immune to the Ninja Turtles’ appeal. Readers can experience the zany time-travel antics when all of TMNT: Bebop & Rocksteady Destroy Everything drops this June, but in the meanwhile, IDW has provided The A.V. Club with Nick Pitarra’s interlocking covers for the first four issues, along with variants for the first four, a first look at Sophie Campbell’s artwork, and solicitation info for the entire mini. Everyone’s favorite numbskull mutants of mayhem get their first mini-series! The most ambitious TMNT event yet! Every week in June sees a new issue crazier than the last! Written by Dustin Weaver (Infinity Gauntlet) and Ben Bates (TMNT) with a rotating roster of amazing artists including Sophie Campbell, Giannis Milonogiannis, Nick Pitarra and Ryan Browne! See Bebop and Rocksteady in the upcoming movie, Teenage Mutant Ninja Turtles: Out of the Shadows! Limited variant cover by Kevin Eastman! 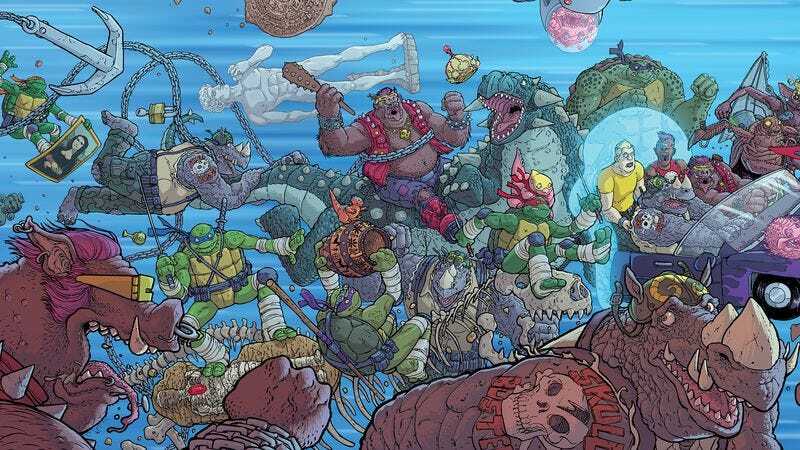 Chaos spreads and the next stop in Bebop and Rocksteady’s itinerary is Stockgen when the Teenage Mutant Ninja Turtles where just regular baby Turtles! After a fight, Bebop and Rocksteady split up and travel separately to different time periods. The Dark Ages, WWI, the Future… no time period is safe!